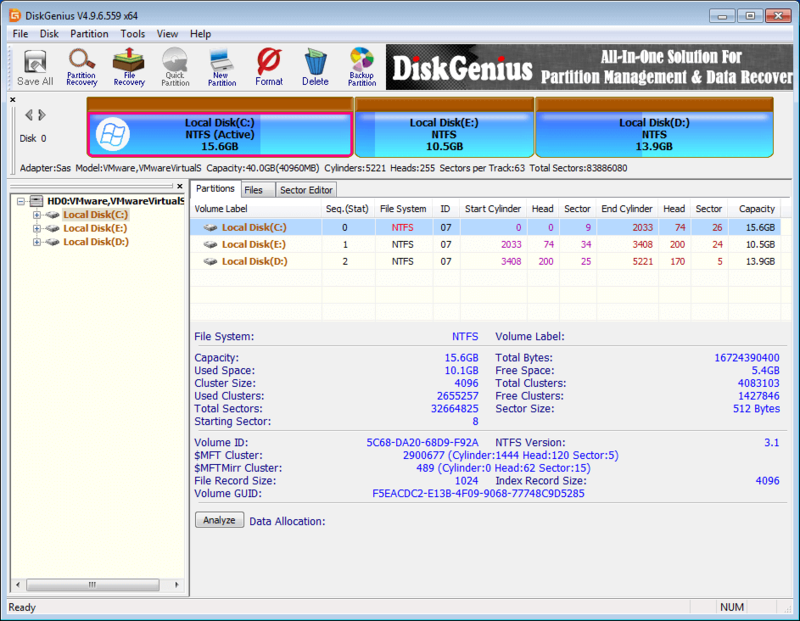 DiskGenius is an excellent utility that comes packed with various useful features on data recovery, disk partition management, backup & restore. With this app you can create, resize, clone, format partitions, backup system, and recover deleted or missing files & partitions from hard drive, RAID, removable disks and virtual disks. Key features:File & partition recovery - It enables you to recover lost data or partition from all data loss scenarios, such as emptied recycle bin, accidental deletion, disk formatting, RAW drive, lost partition, virus attack, system bootable problems, etc. Disk & partition management - supports to create, format, resize, extend, split, image, clone, hide or active partition, repartition disk, image disk, etc. both MBR and GPT disks are supported.Disk & partition conversion - Convert partition table between MBR and GPT without data loss, convert dynamic disk to basic disk without damaging data, convert virtual disk format, convert primary partition to logical without losing data and vice versa.Backup & restore - Backup partition table to avoid partition loss issue; backup operating system, installed apps, settings and data to protect computer against any damage; clone disk or partition as well as create image for partition and disks.Support operating virtual disk files (e.g. VHD, VMDK, VDI), ".img" disk image files, etc. which includes operating partitions and files of virtual disk or disk image.Create WinPE bootable disk and you can manage disk partition when system crashes or there is no operating system on your computer.Hex editor - A Hex editor is embedded to help users edit raw hex data and recover data manually.Check & repair bad sectors for all storage devices and check HDD S.M.A.R.T. information.Wipe data - Completely delete files, wipe disk or partition or erase free disk space so that data can never be recovered. All types of file system NTFS, FAT16, FAT32, exFAT, Ext2, Ext3 and Ext4 are supported. 1. Backup partition, clone disk and clone partition can be performed by way of hot backup or hot migration when current system is active. 2. Support to clone disk or partition by way of booting to DOS or WinPE environment. 3. Allow users to select file system type to be recovered when recovering .